There are several puppy skin conditions that require attention by a veterinarian. Most issues can be resolved through treatment or by improving the pup's nutrition with supplements. In most cases, the Vet can quickly identify and correct puppy skin disease. If the disease does not respond to treatment, then advanced testing is needed to determine the underlying cause. In puppies, a good deal of the protein they consume is directed toward the coat and skin. If the pup doesn't receive adequate nutrition, then the coat in particular will take on a dull color and appear to be dry. Important food components include fatty acids (linoleic acid contributes to the skin as a barrier to infection and disease) and zinc are particlarly important. Cheaper dog foods that are not AAFCO certified often are the cause of puppy skin disease due to insufficient levels of zinc. Puppy Scaling Skin: Skin scaling or flaking with unknown cause is frequently seen in young dogs. If there are no other symptoms then the course of action is to supplement the dog's diet with a fatty acide supplement and to use a spray moistureizer. When the skin condition returns to normal, supplements are stopped. Puppy Pyoderma (impetigo): Pyoderma in puppies is a mild skin infection that occurs on a pups belly that are age 2 to 16 weeks. The pimples bumps and scabs are triggered by living in a cramped space, dirty area, or crowded environment. Other causes include parasites, viral infections or a poor diet. To treat the condition, a puppy should be kept in a clean dry space. Infected areas should be treated with drops of Betadine (povidone-iodine) or chlorhexidine. Skin should be washed 2x per day. 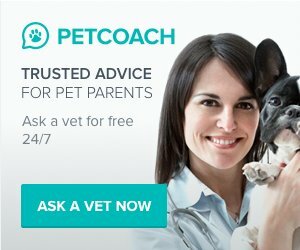 Puppy Pimples (Dog Acne): In some dogs such as Boxers, dog acne is another name for pimples that form around the chin and mouth. To treat, clean the area after eating with a human facial cleanser that contains benzoy peroxide on a wet paper towel. Dot not rub hard, and pat dry after washing. You can use a benzoyl peroxide lotion on the pimples, but do not get it on the dog's lips. Wash all food and water dishes at least 1x per week. 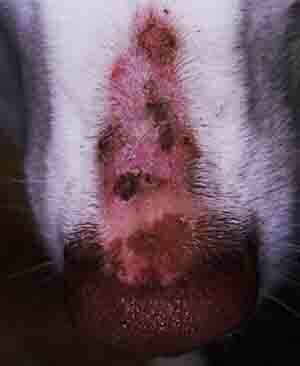 If this does not clear up the dog acne, then consider other causes such as demodex mites (mange). Puppy Mange (Demodicosis): This condition is caused by demodex canins mites that are passed from the mother to the puppy (demodex mites). Symptoms of puppy demodex are patches of missing fur (alopecia) that are in localized areas (4 to 6) or is refereed to as being generalized (hair loss, puppy pimples and lesions all over the body). Localized demodicosis tends to be caused by an inherited condition. The disease is diagnosed after viewing a skin scraping under a microscope. 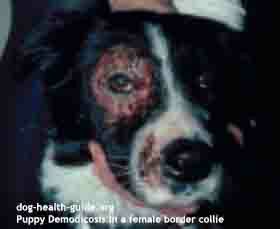 Demodicosis in puppies can cause skin ulcer, puppy pimples and crusting as seen in this 8 month old Border Collie. In most puppies, localized mange does not require treatment 95% of the time and will heal on its own. The generalized form requires the use of a dip such as Naturasil or the prescription Amitraz. Note that due to the side effects of Amitraz is the antibiotic Milbemycin oxime (also used to prevent heartworm). An alternative is the oral prescription medication Ivermectin (do not use if you have a Old English Sheep Dog or Collie due to side effects in these breeds). 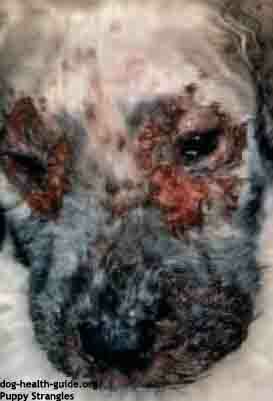 Puppy Ringworm (Dermatophytosis): This puppy skin disease is a fungus that causes pimples and lesions on the face. It is caused by direct contact wiht an infected animal. The veterinarian will diagnose the condition with a Woods lamp (the ringworm will turn color). A hair culture can also confirm the diagnosis. Healthy puppies will heal with no treatment in 3 months. Topical treatments are available including the use of a Lime Sulfur dip such as Naturasil, medicated anit-fungal shampoos and rinses. If required, a veterinarian can prescribe Griseofulvin, which is taken with food. Puppy Strangles (juvenile cellulitis, juvenile pyoderma, juvenile sterile granulomatous dermatitis, lymphadenitis): Symptoms of puppy strangles is an inflamed face and skin swelling. This is often accompanied by swollen lymph nodes. It's a sign that the immune system is not working correctly. The disease can cause pain and reduce the puppies appetite (anorexia). Skin lesions include papules, pustules and skin crusts. Strangles in puppies is treated with corticosteroids (for immune system) and antibiotics (if there are any bacterial infections). It is seen in dogs age 3 to 16 weeks with a higher incidence in Gordon Setters, Dachshunds and Golden Retrievers. 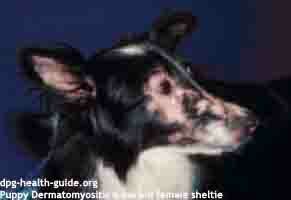 Puppy Dermatomyositis: This is a hereditary condition seen in Beauceron Shepherds, Collies and Shelties. The cause is not known, but can canuse skin lesions that look like pimples as well as hair loss, skin scaling and crusting. Symptoms are found on the ear tips, tail and face. Diagnosis is confirmed by testing a skin sample.